Start reading, and let yourself be carried away with this thrilling adventure which begun on the way back from the Midwinter Run 2018 somewhere on the motorway A50 and ended on a podium in the German town of Thale at the end of the hARz Adventure Race 2018. Whoops, now I’ve spoiled the plot. Just pretend you missed that; since, at that moment of this story, I didn’t have the faintest idea either that it would end that well. Klik hier voor de Nederlandse versie van dit heroïsche vehaal. Sleep drunk? No way, merely saturated with adrenaline I guess, because I didn’t really sleep. Slowly, my eyesight recovers when I am no longer staring straight into 179 night-piercing headlights around me in the starting pen, but I only see back sides of people, running up the slope of the hill. The sky is still pitch-dark at the start, and that’s why everyone starts with a sort of white electric sun on his forehead. The first lap is a vertical one, stretches about 6 km, and begins with a mass start at 4:00 AM on a Saturday morning, in the former East German town of Thale, which is still in deep sleep. It lies in the northern lowland of the Harz, but is almost swallowed by the steep ridges of the mountains, which shoot up immediateley behind the park where the start takes place. It is always a wonderful sight, such a swarm of lights piercing the dark, dancing over a single-track which connects the numerous hairpin curves, like beads on a string. There’s no need to read the map because there’s only one way up, and if you are going for a 32-hours race, you don’t need to be in front of the rest at the start; better to distribute your energy evenly over the 240 km that have yet to come. Well, the first one we’ve had by now. But where we intended to turn right, the human caterpillar keeps the left track. We think for about ¼ of a second… and then follow the crowd. So does everyone behind us, by the way. Well, what difference does it make? Start-1-2-3-4-start, or start-4-3-2-1-start is almost the same. Not running alone has its advantages too. A moment later, we find the the first checkpoint, CP number 4. No looking for blue labels like at the Midwinterrun, here at The hARz, but chipping with an SI, a SportIdent race-bib. That’s nice and easy, as we do not have to write down anything. On to the next point. Like ants swarming onto a pile of food, 180 Adventure Racers try to make their way to the summit. CP 1 is at the top, and along the way up there are CP 3 and CP 2. We deviate from our originally planned route, because everyone is going that way. If you only have 32 hours, you do not have that long to think. That’s what we should have done in advance. That is: at 10:30 PM the day before. Well, not really the day before, since -you remember- I hadn’t slept. When we received the maps at 10:30 PM, an A1-size sheet with on both sides routes, maps, assignments, and the roadbook , we immediately started Tomtomming; and so did all other teams. 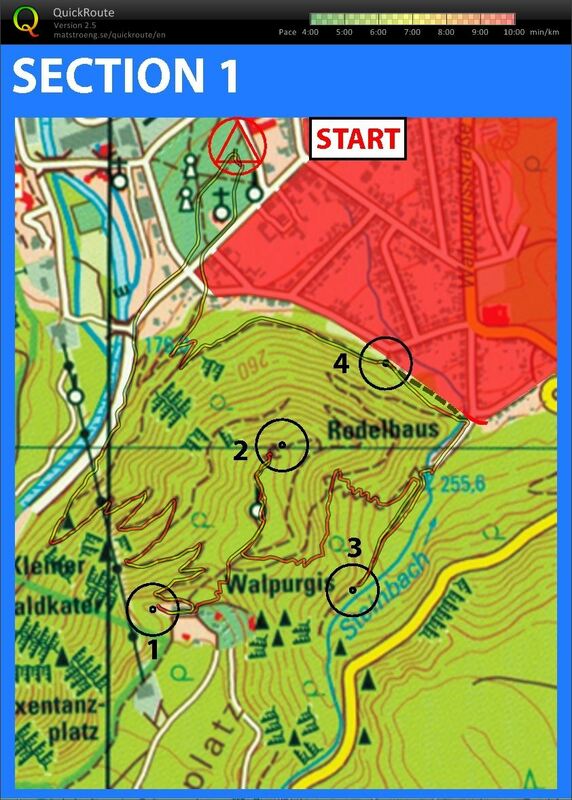 In an orienteering run you get the map the moment you start, also at the WOR or MWR, but in an AR you get it just a bit earlier. So you can already get stressed pretty much before the start. And when it comes to 240 km of routes, it’s no problem to be busy with a marker and a ruler to determine the shortest routes until 2:00 AM, when normal people sleep, and the local night-nozems on their mopeds, who were initially driving circles around our campers on the parking lot behind the abandoned steel mill of Thale, like they have been doing for the past 50 years, have gone to bed for a long time, or at least have run out of their two-stroke-fuel-with-mixing-lubrication. An then to borrow a roll of boeklon (adhesive foil for covering paper) from the camper next to us, the one of WoDi and WoUt, to seal our map. As if it would rain. Still, sleeping from 2:00 to 3:30 PM would have been quite nice. But the subcutaneous tension defeats the sleep. Thinking… I don’t know what I’m doing here. I could just bail out. This is not obligatory. The countdown to this unfathomable adventure, which will last infinitely, which’ length is beyond comprehension, which will undoubtedly lead to all kinds of aches and injuries, this countdown has already started, but the launch can still be called off. Just like that. However, luckily I’m too much of a coward to stop now. Calmly I let this train close in on me. Instead of sheep, I count CPs. And ponder without worrying. Double espresso will not be needed to get up, as, when I open my eyes, I hear how the alarmclock begins to beep. Shoving some oatmeal in, filling water bottles, provisions and everything else, and off we go to the start. January this year, after winning the Midwinter run, Patrick gave me a lift back home to Eindhoven. And, while I was still enjoying that win, when he asked “What about a 32-hour race?” I thought “Why not?”. And, even worse, I thought that out loud. Exactly the right timing, my friend. No way back for me; but it was still 3 months away, so there was plenty of time for training, I thought. While I am good at sleeping too little, 32 hours of being awake would not be the issue. Does a full weekend away from home for this race fit into my agenda? Could I stay awake and keep moving around for so long? Is this fun to do anyway? If you are going to do something that you do not have the slightest idea about what it exactly implies, you can easily worry about not too relevant things. And because you probably realise that yourself, it even helps to relax. But that changes when you put a thermometer in there: three weeks ago Patrick and I would go cycling together. As a training. And we would go running through the Peel area. We would start at 4:00 AM to make it quite well resemble The hARz Adventure Race; at least, the start of it. I had not cycled all winter (okay, to work, and back), and returned home with quite some saddle pain. The list of ‘issues’ had changed spontaneously. How can I avoid having to stand on my pedals after 100 km because I can not sit on my saddle anymore? What on earth do I have to take with me to keep going for 32 hours, when after six hours on two snickers, a white chocolate bar, a muesli bar and a bag of wine gums I am starving? Will I really do this in 3 weeks from now? By the way, where is the Harz actually? You see, the worries are becoming more relevant. Staying awake does not seem to be a relevant issue anymore. And whether it’s fun? That’s also no longer a question now; we’ll just do it. But how? Maybe a soft cushion on my saddle might help a bit. And a pile of energy-rich food. Here on the left you see my stock for the first half of the race. And the formidable super-energy cake baked by Annelot herself (because that was baked fresh the evening before we left for the race) is even missing on the picture. 250 kCal of consumable energy per hour? Seems to me like a good rule-of-thumb. A snickers or half a chocolate bar is then just enough. But a standard granola bar does not suffice. We will see. Let’s pack some extra stuff. But, hey, let’s get back to the slope where we are now no longer standing still, while the other participants pass by. Because I am not really a good cyclist. However, I gracefully reject the towing rope that Patrick has on the back of his bike to pull me uphill; that’s below my pride. So I pedal what I can. Up, endless up. Only by the time we have to switch once more back to the lowest gear (this time very cautiously, because I do not want to risk jamming the whole transmission) I realise that we have had a nice descend in between . With all that mesmerizing and worrying about how I ended up in this incredible adventure, it turns out that time flies. “Endless” is just relative after all. A path to the left, which a few hours ago (I will not say ‘last night’ because the night hasn’t ended yet) we wanted to take (looking at only the map), seems to be closed by vegetation, and so we go right, together with a few other teams. Steep down, nice rush, easy. When I step off my bike to remove a branch from my rear wheel, I suddenly smell something burning. The disc of my rear brake squealed a half circle in the flesh of my calf, because I had clamped the rear wheel between my legs to hold my bike while pulling out that branch. Of course! The energy with which I have just overcome the last hill, has flown back into that steel disc on my rear axle. And this warmth is more than enough to decompose the hair on my calves into something smelly. Do I hear someone laughing at me? I’m really not an experienced cyclist, apparently … But look at the bright side now: it’s getting light. I did a test back home. My headlight, a Chinese Cree XML-T6 from dx.com, managed to keep shining for 3 hours at its maximum brightness. I think, however, that one night is a bit longer than that. Just counting the time, and I get at 12 hours darkness during the race. So I ordered an extra batterypack. Again from China. Not so smart. It did not arrive on time in Eindhoven. Via Tinytronics.nl I buy 6 lithium cells, those huge 18650 ones (true 3400 mAh from Panasonic, instead of Trust-, Ultra-, or Fandyfire rip-off’s that say “3500 mAh”, but that don’t live up to that , not even half of it). And that worked: now I got 9 hours of light. A lot of light. I put a freezer box around it, added a voltmeter to it so I know how much power there’s left, put some cables on it, and it’s ready. But finished it’s only the Friday morning before the race, so until then it’s a pretty high uncertainty factor and stress item on my list. Do I have enough light, and do I have it in time? Can I survive the home-build map holder when I accidentally make a head-first roll over my handle bar? How does my back survive my backpack? Ad 2: I had -DIY-king that I am- hacked something nice: a sturdy swiveling map holder out of aluminum pipe in front of my handle bar that would not vibrate when going downhill. But it would also give not-so-nice injuries and fractures if I would tip over my handle bar. So I modified that quickly in a flexible crumple zone, made out of aluminum strip. Version 2.0. With crumple zone. (The design is not quite finished yet: there is still a flexing of around 60 Hz, so it does not read so well on bumpy paths. And Ad 3: Wednesday night before the race I went to run a bit with a backpack full of food and water, which resulted in a lower back with some scraped open blisters. Bloody thing! If that happened after 5 km, what will be left of me after running a marathon distance with it? The bottom of the backpack appears to have a somewhat sharp, hard edge, exactly where I have two hard, sharp bones. Inventiveness required. Where the recipe of Monty Python’s Flying Circus mainly boils down to making absurd combinations of two essentially normal things, the symbiosis of an item on the list with mandatory equipment for the race and a hard edge of the backpack provides the solution: I sewed my long-sleeved thermo shirt with some basic stitches onto the breathable mesh of the backpack, as a soft perspiration-permeable cushion. Two at one blow (although Wiesbaden is the home of The Valiant Little Tailor who spoke that fierce statement according to a Mr. Grimm -or was it his brother?- and which was later exaggerated as something with seven flies, is not located in de Harz), that is what I achieved, because that was how this, although redundant, but nevertheless still obligatory, warm shirt, was now utilised: as a comfort zone . The shoes will not be an issue. I put complete trust in my pair of blue Inov-8 Roclite 305’s. Terribly robust and comfortable. A lot of grip and with my feet nicely close to the ground. Water may flow in, but out again too. And, as H hour approaches, you see that I am mostly concerned about my equipment. Because that is what I can (or could) control. And the race itself? It will be quite a challenge, but I tell myself that you can not really train for a 32-hour race of over 240 km. Other than being a little fit, having a good sleep the days before, and being in a relaxed mood. Then I will be fine. So -how ironic- I’m tinkering and packing and fiddling and hobbying till too late in the evenings, and therefore I have to finish some essential things only at the last moment. But, when everything is finally ready late Thursday night, I grab a beer and get an excellent night’s sleep. The last one … until Sunday night, as you will see. Do my gears keep up? Do we keep up for 29½ hours? When can we start running again? Because I want to. We stop at the next CP under a bridge, and by bending I align my derailleur pad (just learned that it how it’s called). I’m careful not to bend it too far, because then it breaks. But as a result, I no longer shift from 2nd to 12th gear (out of 11), but just from 1 to 11. As it should be. The last noises and ticking, Patrick resolves by tuning it a bit on the handle bar. That’s 1 worry less. The second? If we cycle on a flat section and we have a chat with another team, it turns out that they think the same. That is normal, apparently. It is that long and that far, you should not think too much about it. Just let yourself fall through it, is how they undergo it. Strange enough, that sounds like a warm bath to me in one way or another. Just like before the race my thought that 240 km in 32 hours means less than 8 km/h (and I run faster than that, let alone cycling), seemed comforting. Unnoticed, I regained all self-confidence. That is what is called “getting in the race”. And the third point? No idea, because I am not the navigator at this moment, while on the bike; Patrick taking care of that. So in terms of our route I feel like dark in broad daylight. I did not memorize the map that well yesterday. Sleep deprivation is not the best stimulus for your memory. Suffering, on the other hand, is, because I remember very well that when the end of this stage came closer, a climb of almost 300 meters height suddenly appeared, and a moment after another one of 100. Just before the climb, organizer Winfried was enjoying the view of the exhausted teams passing by, without any regrets. On our gums we trudge uphill, but then finally our bikes can be dropped down, our water reserve replenished, the sanitary facilities filled, and a tune whistled. Because we are at TA1, which means the first transition area (and there is Winfried again). The next stage is called a hike . Different muscles, new strength. On my bike, my legs felt like pudding, because stage 2 ended with a climb up to the highest tip of the ski area that appeared to be there, but when you walk, apparently you use different fibers that have not acidified yet. Funny, that only the ‘t’ as in ‘traveling’ makes the difference between here and there. We note that there are not many other teams running here, and also that there were only a few bikes around TA1. Would we be in the forefront despite of my chain problems? Actually, that does not really matter now; there can happen a lot, and let’s first make sure we get up to halfway the race. How do we get from TA1 to the obligatory part of this route ? Did we bring enough water and food for 6 hours hiking? Should we walk or run this hike? Looking at this top-3, things are going quite well. Those are not worries, those are solvable issues. So we whistle a tune. ♫ Along the trail we march and sing, ♬ march and sing, ♪ march and sing ♫ and thus we hurtle down the slope, via the edge of a hill in order not to lose too much altitude that we will have to climb again, along the east of the town of Sankt Andreasberg. Issue # 1 has already been solved at the TA, when the organization told us that we are in this case allowed cross the yellow road, which separates the TA from the rest of the route. Normally this is not allowed for large ( yellow and orange) roads, unless a passable section is indicated by red brackets on the map. The landscape around the lake looks apocalyptic: bare light gray skeletons of dead pine trees border the banks. We wonder what has happened here, while eating a snickers. Later on, we walk again along a straight canal, like in the beginning of this route: the Rehberger Graben . Water from the hills is led to the lake, and via similar channels again along a number of water mills, where it used to be used as an energy source from the 17th century onward. An additional advantage of this cultural-historical artifact is that it runs particularly level. Tempo +1. Still, the pace has dropped a bit. Overwhelmed by the heat, despite applying sunscreen, and dehydrated? Would there be a restaurant there? We dream about an ice cold cola. But the building turns out to be closed and abandoned. How disappointing! But we will continue. More teams pop up here, some going in the opposite direction. Would it matter much? With three teams we head the same way, changing positions all the time. And along the way we talk about their previous adventure race experiences (which I do not have, but Patrick does). At a CP just before Sankt Andreasberg, when we are almost back at the start, there is some doubt about the correctness of the map. Another CP leads us down into a deep valley below the village. Where we then have to climb out again of course. The shape of the terrain forces us to make a considerable climb and inevitable descend. We do our best to keep a leveled track, but the last climb back up the ski slope cannot be avoided. We need some recovering when we are back in TA1, at our bikes. With – finally – the deserved cold Coke. It is getting warmer and warmer. Are we drinking enough? We are ahead of our schedule. Does that mean that additionally we have to do the bonus stage at the end? That is quite some extra distance. Did we really choose the smartest route at stage 1, or would S-4-3-1-2-S have been shorter? But is this also what you, dear reader, think now? Or are you wondering if you’re not yet halfway through this story? Because occasionally it is a bit lengthy indeed. Well, I will tell you this: at this point, we are not yet halfway along the route, and not even halfway through time. It will take another five hours before we are halfway at all. In other words: the finish is still far, far away. And that’s exactly what I’m trying to convey here. So sympathize. And read on, because if you do not continue, there will be no end. In the meantime we won’t win a race with commonplaces, so we continue cycling to TA2, along the water just south of the dam. We leave one of the bikes, strap the other one onto the canoe, and have our inventory checked by the organization. There is a mandatory list of attributes that we must bring, including a warm sweater (or a kind of soft pillow at the bottom of my backpack), a whistle ♫ and a break-light . We have it all, so we pass the test and are allowed to continue, so we start paddling over the lake with a light headwind. The coolness of the water feels good. It looks like a short vacation during this stage 5. Actually it is one! Who else will see all the most beautiful spots in the Harz area in only 32 hours? This is the Harz for Japanese, but without a camera. Flash. Stage 5b is unannounced: carry canoe for 500 meters. And bring a bicycle too. And as quick as possible. But then the fun starts: from the one AR that I have ever done before, I found that the best part: the Run-Bike stage. A bit of an explanation: with a team of 2 you go 1 route with 1 bike. Not a tandem, nor going together on the one bike; that’s not allowed. So one of the two is the leap, and has to walk. But it is leapfrog, because after a few hundred meters you suddenly find a familiar bike in the verge, you jump onto it, and pass your teammate while cycling, after which it’s your turn to throw the bike back into the verge. The challenge is not to lose each other out of sight at a junction, so continuous communication about the route is essential. I like it. We do over 15 km of his outdoor game just within 2 hours; the total climb is about 600 m. (So that’s 15+6=21 km with the 100m ↑ = 1km → rule) Sometimes cycling is no option, and Patrick – what a king! – carries the MTB up on his shoulders, or carries it over entire trees. The landscape around the lake is beautiful, and the lightning fast alternations of running and cycling keep us mentally razor-sharp. That changes quickly when we start biking again. The road uphill climbs monotonously from the lake, with almost 10% slope, along an almost 5 km long road to a top. What initially starts with having pleasant fresh legs and feeling quite awake, eventually becomes a state of half-sleep. All urgency disappears, partly under the influence of the rosy evening sun. And at the end of the climb, at the CP, with a view over the lake, we sit down on a bench for 120 seconds. Then suddenly some mental alarm goes off. We must continue! Twilight sets in, time to wake up again. We are no longer ahead of our schedule. The cards have apparently been shuffled again (and we have been playing a bit longer in the hills around the lake). Would we still have enough time left for the final bonus stage? It suddenly is getting colder; do we have enough clothes with us for a cold night? Fortunately, I still have a warm ‘cushion’ on my backpack. If we go slower than expected, do we have enough light (as in: battery charge) for the orienteering stage, which I run on a different battery pack than the one on my bike? It takes a while before I realise that the night will not last longer if it takes us longer. Contrary to ourselves, the sun turns it rounds without getting tired. And the later we start the orienteering stage, the less battery power we will need. But it is getting dark quickly now. Almost as quickly as we roll down the slope, chilled by the wind that evaporates the moisture on our sweaty skin. Fantastic how an eagle flies just a bit in front of us, just above the road. What huge wings, we think about him; what huge speed, he thinks about us. The next CP we find at dusk, but the one after that it’s really dark. Although it is close to a road, at least on the map, it is actually 30 meters above, on a rock. But that does not appear to be true either: this is a CP with a large Woudropers aspect. We find a bearing and distance. Peering along the needle of our compass, an increasing loud buzz arises just in front of us, which seems to come from the direction of a few red and green lights. Which in turn approach us too: they are attached to a drone, which is filming us. Does each team get their personal video afterwards, or is the camera team coincidentally on our heels? No time to think about it, because we have to go to the designated point on the other side of the valley. The bearing seems not by the least correct, but the description of our target, “Bergmannsbaude”, leaves no doubt. This stage all CP’s are located “slightly” higher than the road. What a “fun” theme (haha). So we go climbing a few dozen meters of stairs here. Back at the bikes we realise that we had better towed them up there in the first place, because the obvious continuation of our path continues from the Baude. Uphill. Later this stage, another higher-than-high mast will follow, towering 20 stairs above the treetops. From the top of the tower (of course the SI of this CP is not below, what would you think? ), we we can see in the distance a pair of MTB headlights. That must be other teams. Who else cycles through the woods at 10:45 PM here? But they are far enough away not to make us feel rushed. Only the temperature makes us go fast, because despite a windjack, it is feeling quite cold now. The last kilometers to the start of the compass-orienteering stage pass quickly; they lead us downward, and thus we feel quite fit when we arrive at TA4. The bag of provisions that we have handed over before the start, and that we can get here at TA4, either before or after stage 8, make us doubt for a moment what to do, because if we collect it now, we will have to carry everything while on foot during the next section. But since there is still enough food in our backpacks and on the bikes for 16 km running, we decide not to collect the bag now. Besides, at this TA there are hotdogs, cocktail nuts, crisps, peanuts, biscuits and bananas. So we stuff ourselves with an energy buffer, shoot an arrow in the bullseye of a target (special task; hitting the board saves 10 minutes of penalty), and we fill the water bags, take our compass and go. What could go wrong? We should excel at this discipline, so that puts some extra mental pressure on us. Can we cope with this extra tension on our shoulders? Oh, oh, how exciting this is! As time flies, the bonus stage is probably no longer in reach, but is the final orienteering stage still completely doable? How cold will it get during this clear-sky night? While planning the routes in advance last night, apparently we were less sharp than now, because we did not notice that, according to the roadbook, a number of CPs are located near high voltage pylons. And those are usually quite accurately placed 250 meters apart. Which would make locating the checkpoints a whistle of a dime, were it not for my sightings that seemed to be always 5° too far clockwise. We appear each time too far “to the right”. That’s not too bad in the open field, where you can still see the CPs from 50 meters away thanks to the generous reflectors attached, but on the way from CP34 to CP35 it turns out to be disastrous. Look at our GPS track on the map below. Initially, we head spot on, but because it becomes quite a jungle halfway, we start following a more passable firebreak, and we arrive too far north. We follow a stream, which is shown on map in the tiny circle, in southern direction, but we find no CP. Thinking that we were already too far, we head back to the previous known point, try again, but now deliberately head a bit too far to the north, so that we know for certain that we have to follow the stream to the south. And now we succeed, albeit with half an hour delay, to score the CP. Afterwards, it is clear that we were pretty close by at the first attempt. This is clearly a thing to improve. And I still thought that we would score above average here. Bummer. For now: first CP37, then CP36. The black dashes on the map, a railroad, are a robust stop line, so we aim for that. There is a waiting booth next to the railroad. With a reflector and an SI station. It would not …? That must be the shelter / Schutz are from CP36. Would that assignment be that transparent? That seems quite unlikely. Why would they first send us to a rather difficult point in a circle on the map (CP36) where nothing recognizable could be seen, and then direct us via a winding path (the red dotted line) to a very recognizable point on the map? Moreover: if you walk back from CP37 you would look directly at the guardhouse and in the night you can not miss the reflector that’s hanging on it. Anyone who starts looking for CP36 first has bad luck and loses a lot of time; while those who first aim for CP37 win the lottery with two fingers up their nose. And a lottery it is at CP37 too. The CP should be near “a fallen tree”. And there are more than enough of them there. With somewhat more luck than wisdom, we find the needle in the proverbial haystack, and can go back to the start, TA4. Fast like lightning. We run the whole stretch. The TA is suddenly 10 times more crowded than when we were here 3½ hours ago. Food, and food, and more food. Pasta, sausages, nuts. Everything tastes equally good. Because we are almost at ¾ of the race, with only 8½ hours to go, an amount of food equal to the 1st half would be heavily overdone. And I mean literally heavy. We brought half our ration at the start of the 1st half, and handed in half of it for the 2nd half of the race. So a hand full of bars and sweets is left behind. I will never know how the muesli-choco bars of Albert Heijn taste, and the chocolate-orange bars of Decathlon also lose it against a pack of dry sausages and the unbeatable energy cake baked by my daughter herself. More on autopilot than anything else we keep cycling towards the daylight. Occasionally sleepy, then awake again. Mainly because of the hours and hours without sleep and the endlessness. Lumbermen are no longer men with a red checkered blouse and an ax over their shoulder. No, not even with a chainsaw and a beard and a foolish hat. They sit on heavy machines that pick the trees from the ground and cut them in lumber on the spot. At least, that’s what I suspect. Continuing is simply a matter of not stopping. What I do know for sure is that they leave knee-deep tire tracks with a fist-deep profile of ridges that shake you through and through if you try to ride over them with your MTB, while you unsuccessfully try to keep the speed high and not to swear. The latter can not be avoided when somewhat later the map does out to be incorrect at some point. But can the map help it if someone has cut some extra roads out of this timber plantation? I would do so too, given the extortionate prices for wood at the hardware store. Money doesn’t grow here from the trees, it is the trees! But anyway, this gives us the chance to make up for the errors with the compass bearings, and to show off our orienteering skills, because soon we regain our route and hit the next CP, because we quickly deduce where we are, based on the contour lines on the map. What is it we do not know now? Did we make the right choice with the CP at the station? Or was it fake? It seemed just too easy. On the other hand, this is not a WOR. How will the temperature develop As long as we keep moving, is it okay, or do I have to detach my thermo shirt from my backpack and wear it? Do we keep the Sandman from our back, or will sleep overwhelm us, like it did with so many teams at TA4, who were napping against each other under their emergency blankets? The sun is rising for the second time today. That is quite a confusing experience. Our feeling for time has completely dissolved. The recollection of the hours on this last bike stage are now more like a sort of time-lapse video in my memory. Some brief flashes of notable moments with noting in between. Chronology is missing. We eat until the cow comes home, and drink the bottles empty. Endlessly many trees are the witnesses. I flip over when my front wheel gets stuck suddenly in the weak clay of a dam in a ditch. The wrinkle zone of my map holder on my handle bar works perfectly: the map is now in a totally bent position, but I myself do not have a scratch. We continue as if unperturbed. We make a turn at every intersection. No valley that isn’t followed by a hill. But suddenly, there is a village again. Friedrichsbrunn seems abandoned. Who would be here at a quarter past six in the morning? The answer is obvious when we report to TA5. There haven’t been many teams here yet. I guess there are twenty bikes, at most. The first team has been out on the next stage for 5 hours now, and they haven’t reported back yet, we hear from the organisation. If we take too long, it will be tight to arrive at the finish in time, let alone to do some of the bonus stage. 12:00, at noon, is the deadline. We estimate that we needed 45 minutes for the road back to Thale, to the finish in the Bergtheater. So we have exactly 5 hours left for 30 km of orienteering. I joke: that’s like a complete Woudlopers Orientation Run. But then in less time, with more elevation. Do we have enough time? We had already decided that 4 of the CPs of this stage do cost a lot of vertical distance. But it makes no sense to leave regular CPs in favor of bonus CPs. For the final score at least. But if the teams ahead of us needed at least 5 hours…? That bonus stage, there is no need to do it, if we do not even check all regular CPs. And it is not reachable anymore, given the time left. So after this stage, there is only 8 km of cycling, not 56. That’s a comforting prospect. Is 30 km running anyway not a bit too much at this stage of the race? Because it’s me now who is doing the map reading, I remember many more details than from the bike stage. But, my dear readers, let me spare you the details. Want to hear how the caffeine gel tasted? Or the muesli-lemon bar? That there was a pebble in my shoe? That after 2 minutes we took off the windbreakers, because it suddenly became a lot warmer? That we had not met anyone since the start of this stage? That one of us at a given moment was literally sleepwalking? But that after an almost vertical descent to cross a valley with a creek that was quickly over? No, I guess you do not want to hear all of that. I’ll reel forward just as fast until it becomes exciting again. This is the time when I normally ride my bike to work, and when the better ideas of the day arise. Or rather, the subconsciously matured ideas of the night submerge to the surface of consciousness. So they do now . We start counting: 2:30 hours to go, each CP we reached in roughly 30 minutes, and we still have 3 CPs to go, and then the track back to the TA. That leaves some space for more points. If we can still make it to one of those points that we skipped in the first place because they would cost excessive altimeters, that might just fit. Provided we increase our pace a bit. But if it does not work, then we may arrive at the finish too late. Every 10 minutes after 12:00, starting at 12:01, will cost us one CP. So if we do not make it, this extra effort is wasted, and even worse, if we will only arrive at 12:11, the penalty is again larger. It’s a gamble. But it is a sensible estimate. And an exciting one! Nothing ventured, nothing gained. We decide to postpone the decision until CP50: there we’ll decide whether we first go along CP48, or directly via CP49 and CP51 to the TA. Cool! Suddenly all sleepiness has evaporated. Suddenly no caffeine is needed. All of a sudden, a heap of energy has emerged. We are even running uphill now, crossing right through the green forest until CP50, and there we only need a few seconds to finally decide: We go for it! While running, we sped to the north. Suddenly there are other teams there too. They come from all directions. But we ignore them. We have our own plan. I do not mention the observation that the path runs down a river. Descending means climbing too. I know that Patrick is a little less backing the decision to go for CP48 than I do. And I tell myself that we will be at the top at CP48 within half an hour. Descending and climbing more meters was not part of the plan. We go all the way, to get there quickly, and indeed, after 25 minutes the CP is checked. We hit CP49 within schedule too. But CP51 is on a summit. So one last climb, now with some other teams surrounding us. With all soured muscles it is almost impossible to scramble over the immense boulders around the top, looking for the SI unit at this CP. This is without doubt the best hidden point of the entire race. But Patrick spots it, and then it’s done. This already feels like finishing, and we still have an hour and a half left. Yet we do not want to waste time. The interesting thing about those races is that you have no idea who your competition is at that moment, and what their position is. All those other teams that swarm around here may have checked more or fewer points. The only influence you have is to go as fast as possible yourself. And no matter how tough it seems after more than 30 hours of non-stop sporting, it is a relatively simple task. Simple is good. Nothing hurts now. Back at the TA, we quickly jump on the bikes. We head in a different direction than the other teams. We think we have found a smarter route that leads only downhill. Let them cycle the shortcut, uphill. We speed downwards. Ehhh … why does our track suddenly go up? That was not the plan! Turns out that reading elevation lines is sometimes a bit too farfetched after 31 intense hours. Pushing the bike by hand, we conquer the last slope. Horizontal at last. But not much later we go down again: what a speed! A last hill to the Hexentanzplatz, and roaring with effort, we climb the last obstacle. But what does it matter, we are there! We drop our bike, run into the arena shaped theater, and check our SI for the last time. Could we have scored even more points in those last 45 minutes that were left? Did we or did we not choose the best route for that last descent? Thinking about everything, feeling satisfied, and proud, about could beer, that you recover on your way, that we had no major problems, no injuries, a lot of sport drinks, endless energy bars , whether there was a false CP at that station, the whole shebang mixed together. The last thought I remember is that the sun is burning in my face, and then I realise that we are now with the camper at the base where the prize ceremony will take place, in the sun, and that we have slept for 2 hours. Slept! The first time since Friday morning! But time to get up, as there will be food in fifteen minutes. Lots. I do not get enough of it, permanently feeling hungry this event. Eagerly everyone else is filling their plates too, especially with meat. And then it’s time for the prize ceremony. Winfried is not a man of few words when there’s a lot of audience, But indeed, one can not end a 32-hour race within half a minute, with a quick prize-giving. Once it’s time for the Pro-2, our category, a shock strikes me when “31 hours 17” is called. Didn’t we return at 11:17? That can not be true. But it is! Like stung by a bee we jump up (where that strength suddenly comes from?) and walk to the podium. A bronze medal, who would have guessed that? I enjoy it with disbelief. We finished directly behind the other Dutch Adventure team. We still owe them a roll boeklon. It was worth it! Will I do this again? Definitely. Next week? No! It is impairing. At a short orienteering race, the Wednesday after my legs give up sooner than normal. During the first days of the week after, I’m not in the mood for writing this story. But at the same time: the thought that we have accomplished this, that we can perform top-sport for 32 hours, that the body has a gigantic resilience, those things give a tremendous confidence, and thinking of our unimaginable result gives tremendous energy. This unique experience is definitely more than worth the effort. I can not resist analyzing stage 1. And guess what? Our sequence of points was no longer than the alternative, so there was nothing wrong with that afterwards. Try to determine the shortest route from the start along (1), (2), (3) and (4), and back to start. Do you want to stay informed of updates? Then leave your email address here on the right side, and you will receive an email if I write something new. That’s great: at the bottom of this page, you can enter your own time and distance! While running, I’m often wondering: while orienteering, it’s “which way?”, on the road, it’s “how fast?”. Like: “I am now running at a pace of 4’01”, I’m halfway my 1 km interval, how much fasther should I run to get to an average of 3’59” by the end of this interval, and how much does that differ on half a marathon?”. That type of questions. Some time ago, I discussed (and calculated!) that you shouldn’t be thinking while running, at least not when you already know whereto and how fast, but that is even more a motivation to do that beforehand. And, while running, dig the answers from your memory. That’s the reason for this article. Let’s start simple: for once and for all -and that will be this year- I want to finish the Half Marathon within the one-and-a-half. So, that is 21.098 kilometer in 90 minutes. Dividing those figures results in a speed of 14.06 km/h (or 8.74 mph). With some experience I gained, I got a feeling for that speed. But still, it’s better to comprehend when express it as 234 meter per minute. And it sounds quite fast when I say 3.91 m/s (meter per second), which is about twice what I’m tall. Since I take part in Orienteering races, the pace started to make sense to me (and because my GPS watch tells me). And now I know what it means to run 4’16”/km (4 minutes and 16 seconds per kilometer, or 6’52”/mile). I get a feeling for it. And, because I know that I have to keep that pace on the Half Marathon, it’s my reference for everything. 4’00” /km sounds already very quick, but recently, while training intervals with some colleagues, we incited each other easily to below 03’50” /km, and even with a sprint at the end, of 03’40” /km. Yet again, it’s easier to survey 100 meter than 1 km, especially when you want to estimate a distance on the road (the same as between the two ‘hectometerpaaltjes’). And, for my desired pace, I need to accomplish those 100 m within 25.60 seconds. In my case, per 100 m, that is about double paces, representing 1.29 2pace/second, or 77 2pace per minute. In the past, I have looked into the relation between speed and heart-rate, (see my article Linschoten Loop on my blog), but I assume that that changes with time, with your training history, and with the terrain. And there is no space for that discussion here. But what occupies me most, on my way, are the relative differences: how much faster should I run per 100 meter to finish one minute quicker? And, while running, I am typically not fit enough to realize that one minute contains about 60 seconds, so for each individual kilometer of the 21, that is let’s say 3. Or 0.3 seconds per 100 meter. That’s nothing! If that’s all for a finish time that’s one minute better, give me 10! You may have noticed that for every minute you subtract from your projected finish time, the required increase in speed, per minute, becomes larger. Not only the speed itself –that’s obvious– but the speed difference too. Meanwhile, the difference in pace is always the same. The relative difference, in %, of the time per 100 m changes, but the absolute difference, in s per 100 m, stays the same. It’s all logical, but it may be practical to remember while you’re on the go: time over distance (pace) is linear as a function of the finish-time; speed, and relative changes in pace, are inversely proportional. When you run the first half 1″ per km slower than the 4’16”/km you should run, you will have to catch up those 21.098/2 s during the second half. To do that, you will have exactly half of the total 21098 m available. So you have to run exactly 1″ faster per km, than the overall average. The net difference is 2″/km with respect to you pace in the first half. Sounds easy. For 1:30:00, you will have to run precisely 4’15.98”/km. Your GPS is not that accurate, but fortunately it’s close to 4’16”/km. However, you will just miss your target time by 19 ms. That is 19 milliseconds –not much, but all your hairs grow about one atom in that time, still at total of about 1/100 of a mm altogether. You miss your target by 7.1 cm! But, if you would have run 4’15”/km (the difference is hardly visible on your GPS watch), that will gain you advantage of 21 s at the end. Just a matter of approximation. Again, this a figure that is easily remembered: for every 1 second you run faster than planned, on a distance of 21.098 km, you gain in the end as many seconds as there are kilometers. For every distance! If your run a a bit slower, and have to cache up at the end, then it may be interesting to express that lag in meters. Just as if, at that moment, you pick another runner -who keeps running at a constant pace- that many meters in front of yourself, and strive to overtake him right at the finish. Suppose, you ran 1 second to slow per kilometer. Then, at the end, you have to catch up that 21.098 s lag, what, right at the end (which is in fact too late) boils down to 82 meter. This way, it sounds quite tough. And, when you find out 1 km before the finish, that all the time you aimed at a pace 01:31:00, one minute too slow, then you have to overtake, in that last km, someone who, at that moment, is 223 meter in front of you. No, you’re not going to make that. There are a few things to remember: Suppose you’re in terrific shape, and it goes very smooth. You can keep a pace of 4’00” /km, then you will finish at 01:24:23 Fantastic! To get a feeling for those finish times, I have written them on a dial: thinking in time like an old-fashioned clock is -for me at least- still the most intuitive representation. On top of the dial it says 4’00”, and ever second/km more counts clockwise. Can you print this one on your retina? The moral of the story? Just run just below the 4’16” /km, and you need not think about anything. That saves a lot of energy!